Entrance to a tomb. Click on any image to enlarge it in a separate window. 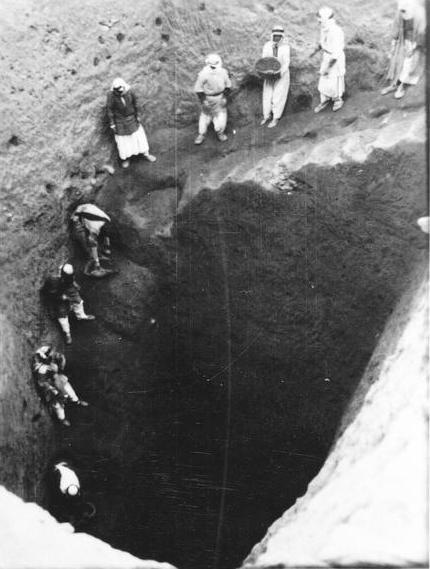 Excavation of the tombs. This photograph gives some idea of the depth to which some of the tombs were buried. See the image additionally enlarged. 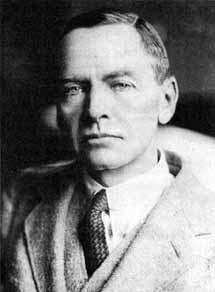 Leonard Woolley, the explorer of the Royal Tombs. Progress of the dig. Enlarge. More progress on the dig. and Carchemish, was chosen to lead a joint team of archaeologists from the British Museum and the Pennsylvania Museum to explore the environs around the great ziggurat at Ur. 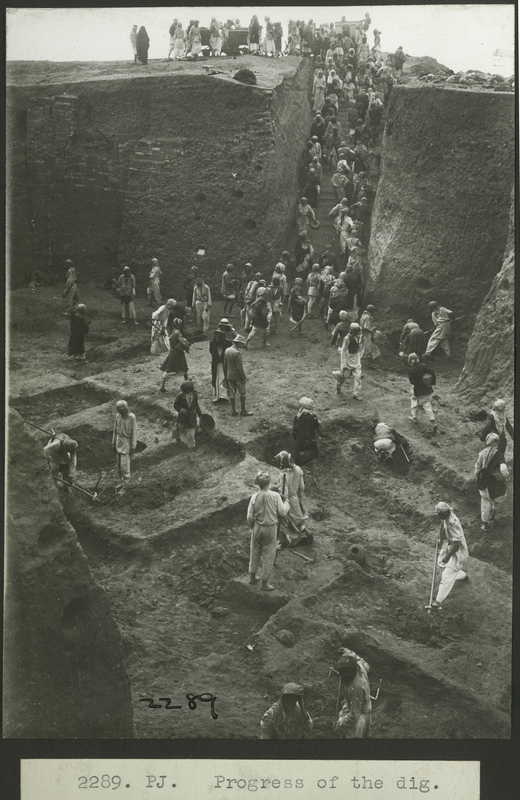 Woolley's greatest discovery at Ur was the so-called 'Royal Cemetery', which he began to excavate in 1926. Work on the site would continue for the next twelve years (no further excavations have been done at the site since then). He would later be knighted for his work in the field of archaeology. 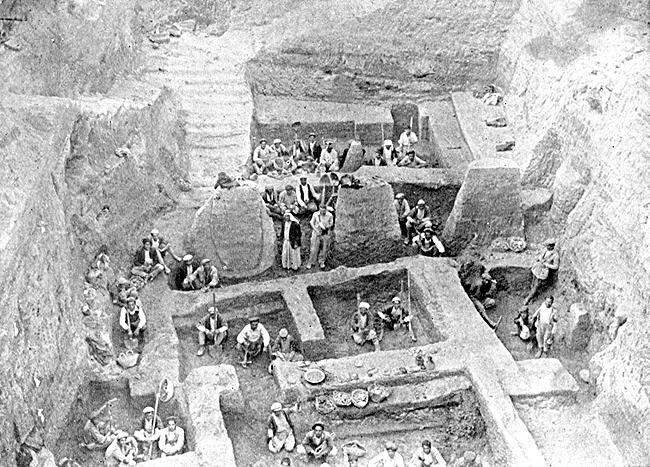 There is a complete story of the excavations on the website of the Pennsylvania Museum of Archaeology and Anthropology. 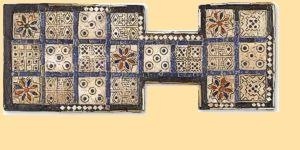 For further reading see Treasures from the Royal Tombs of Ur by Richard Zettler, et al; which is the definitive text on the subject. 15 of the16 Tombs of Ur that Woolley considered to be "royal". PG 755 is not shown since it is partially buried beneath PG 779. 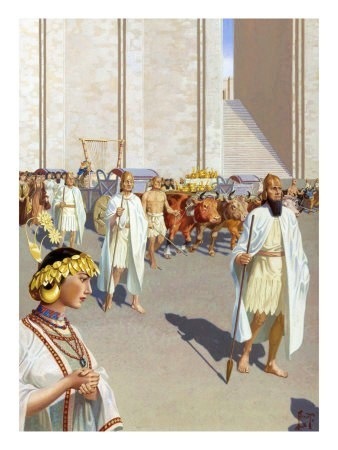 The cemetary was originally dug outside the walls of the city of Ur, and were built over by the walls of Nebuchadnezzar's larger city about 2,000 years later. 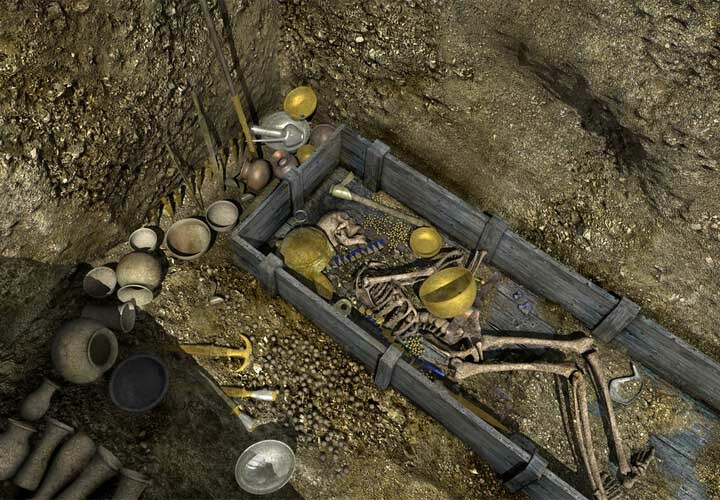 Some 1,840 burials were found, dating to between 2600 BC and 2000 BC. 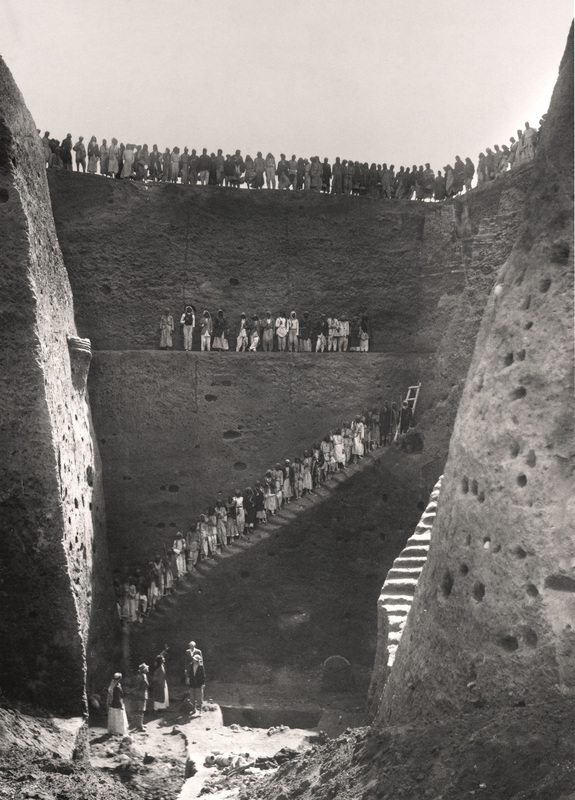 They ranged from simple burials (with a body rolled in a mat) to elaborate burials in domed tombs reached by descending ramps. Sixteen of the early burials Woolley called 'Royal Graves' because of the rich grave-goods, the presence of burial chambers, and the bodies of the attendants who had apparently been sacrificed. 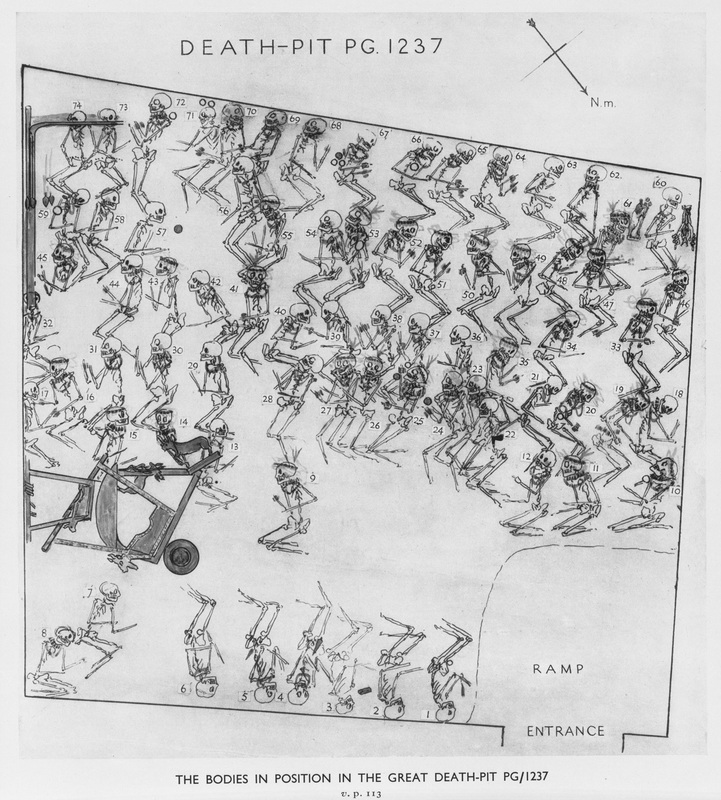 The Great Death Pit: PG1237, with its 74 attendants, was the most spectacular of Ur’s royal tombs. 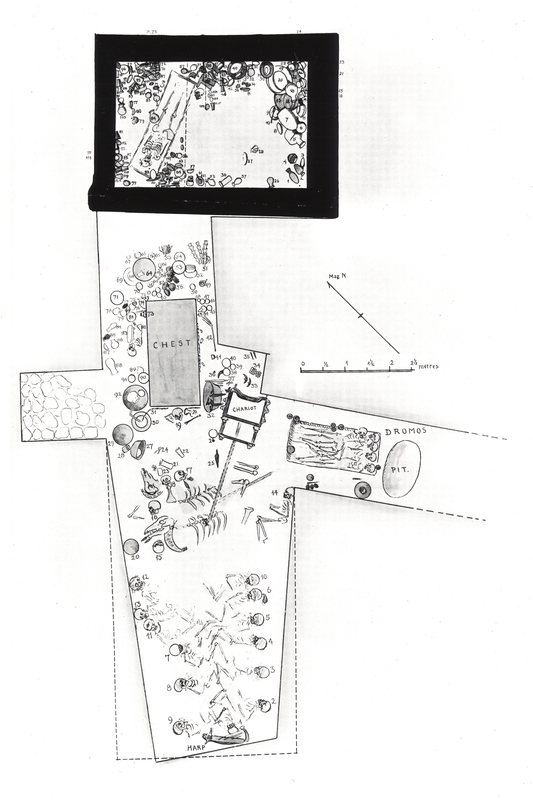 Woolley called any burial without a tomb chamber a "death pit”. 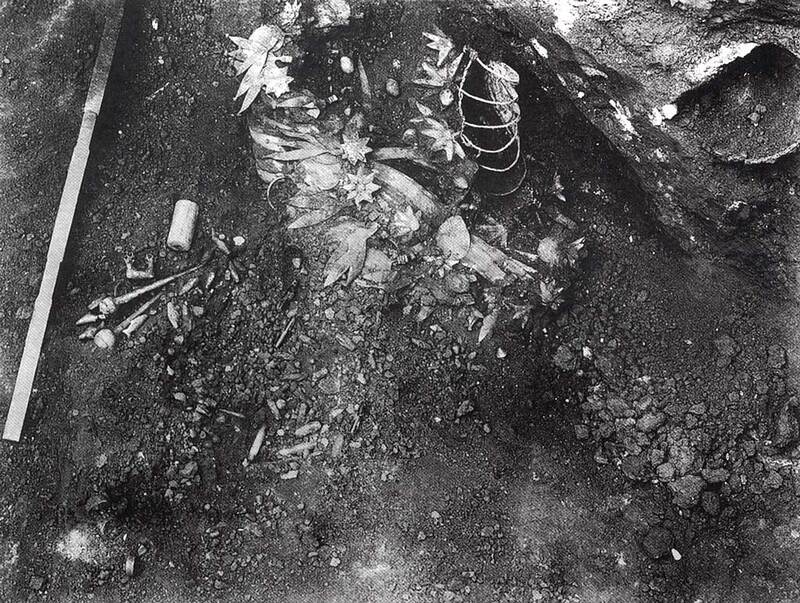 He named PG1237 “The Great Death Pit" because of the many bodies that were found within it. "PG" means private grave. Enlarge. so they could guard the tomb against grave-robbers. 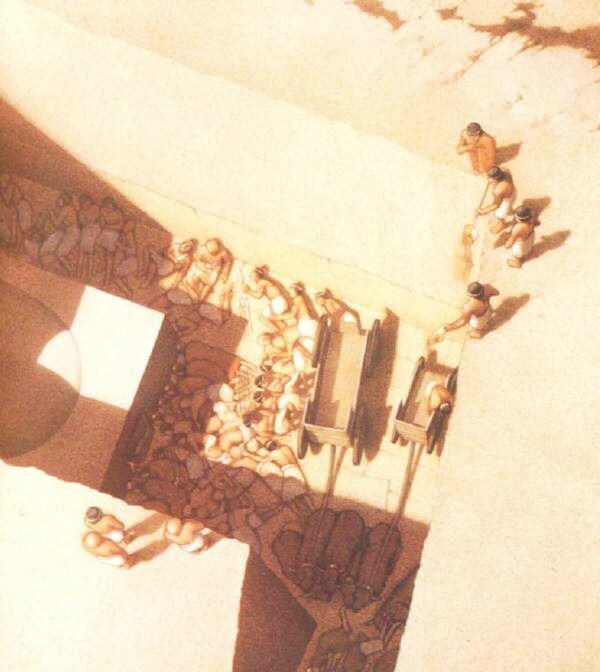 Most of the women were in four rows across the northwest corner of the death pit. The women were dressed in scarlet. 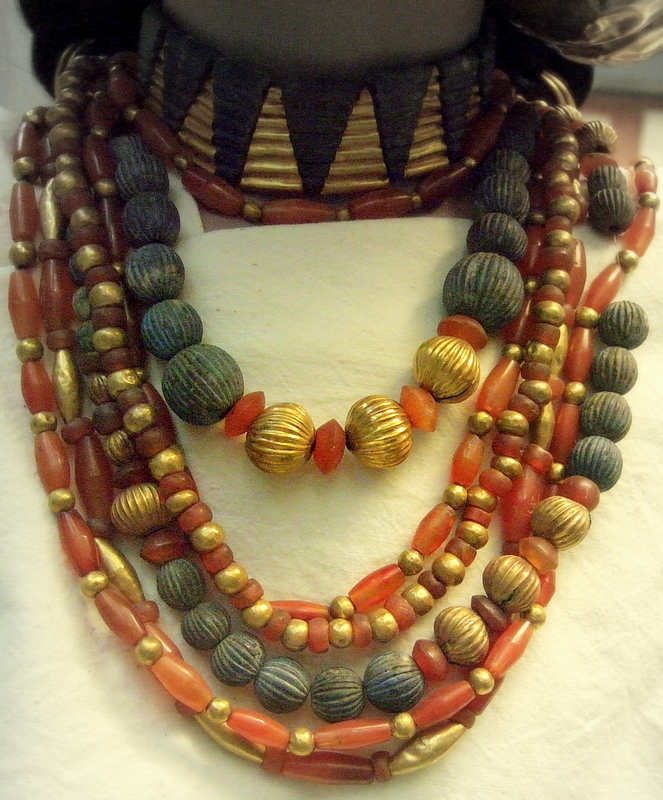 They wore ornamental headdresses and were adorned with jewelry of silver and gold, lapis lazuli and carnelian. Six women lay near two lyres and a harp, near the southeast wall. 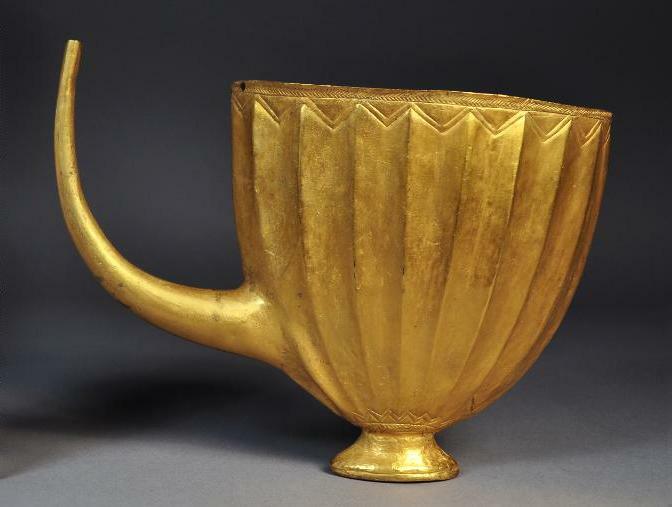 Almost all of the women had cups or shells containing cosmetic pigments. Body 61, in the upper right corner, was more elaborately attired than the others and she held a silver tumbler next to her mouth. Half of the women (but none of the men) had cups or jars, as if at a banquet. One of the women was found still clucthing a coiled ribbon for her headband, as if she had been late for the ceremonies and was too hurried (or frightened) to put it on. Perhaps the attendants voluntarily took poison and were buried while unconscious or dead. The neat arrangement of bodies convinced Woolley the attendants in the tombs had not been killed, but had willingly gone to their deaths. He suggested that in so doing they were assured "a less nebulous and miserable existence” than ordinary men and women. The soldiers had weapons of gold and silver and the insignia of their rank. 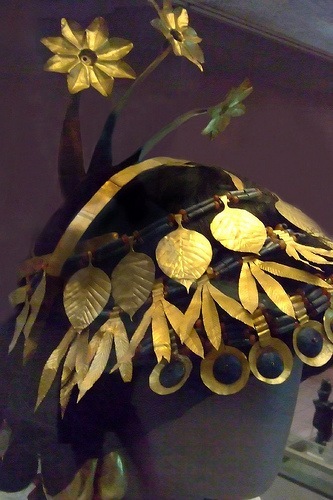 The women had golden headdresses and were heavily bejeweled. In life they would have looked like royalty, but the soldiers were commoners and the women were servants. In sacrificing themselves, they were hoping for a better life for all eternity. A sudy was recently done at the UPenn Museum on the skulls of a woman and a soldier. Both skulls show signs of premortum fractures that were caused by a blunt instrument. This was deemed to be the cause of death, not poisoning. The two theories, death by poison and death by blunt force trauma, are not incompatible. It suggests that the participants whose dosage of poison had not proved to be fatal were given a coup de grâce to spare them prolonged suffering and to insure they wouldn't be buried while still alive and conscious. Another possibility is the attendants drank a strong sedative, rather than poison, and then were clubbed to death after they were unconscious. This, however, seems to be a needlessly crude and messy alternative, and not befitting the dignity of the occasion. It would also mean the injury would be evident on all of the skulls. It remains for further scienitific testing to prove the exact manner of death for the majority of the participants. body of a king or a queen. It has recently been suggested that Body 61 is actually a queen, like Queen Pu-abi (described below) because she is more elaborately attired than the others. This would seem unlikely: She wasn't buried with her cylinder seals, like Queen Pu-abi; she doesn't have her own personal possessions, and she doesn't lie on a funeral bier in her own burial chamber. Her body lies in the jumble of other bodies, with nothing except her better jewelry to show that she has a greater status than the others. By the same token, she could just as easily be a favored concubine. The details of the drawing are best seen with enlargement. 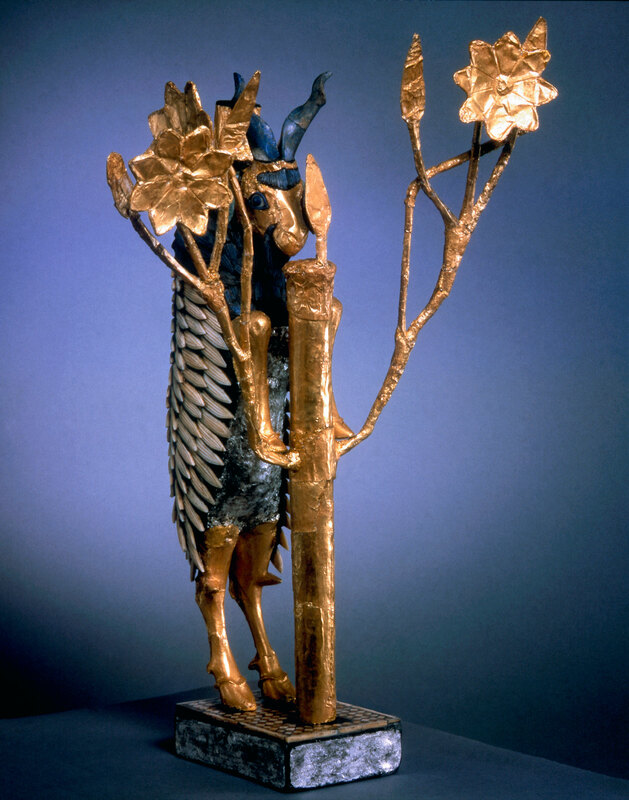 In the picture, you can see two bull‑headed lyres and a "boat lyre", the two "rams in the thicket" (pictured below), Body 61, the headdresses worn by the women, and the small cups that they are holding. Modern reconstruction of PG 755, the tomb of Mes-kalam-dug (or his grandson). 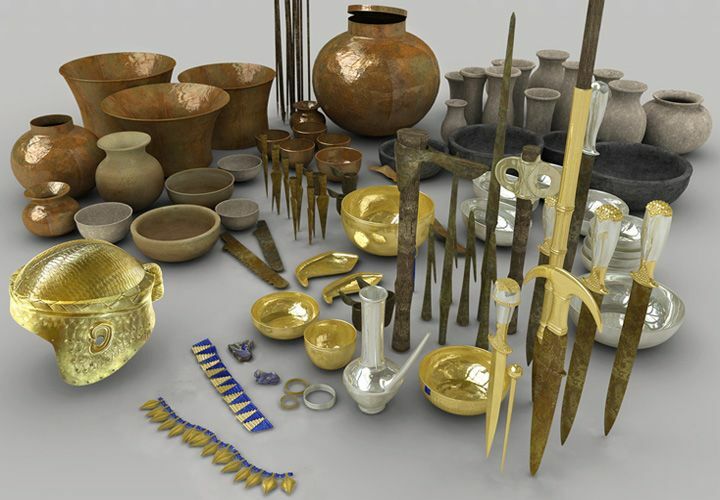 See a picture of the reconstructed artifacts, from itlab.ibam. 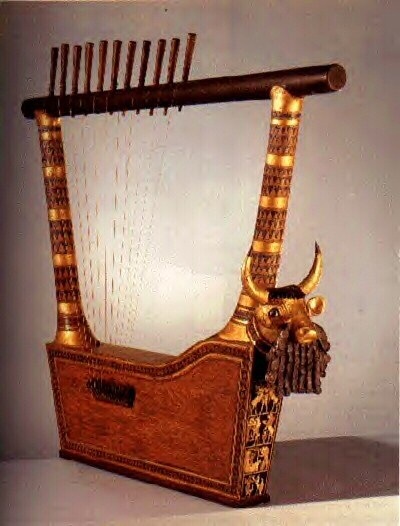 The Great Lyre, found in the King's Grave pictured below. 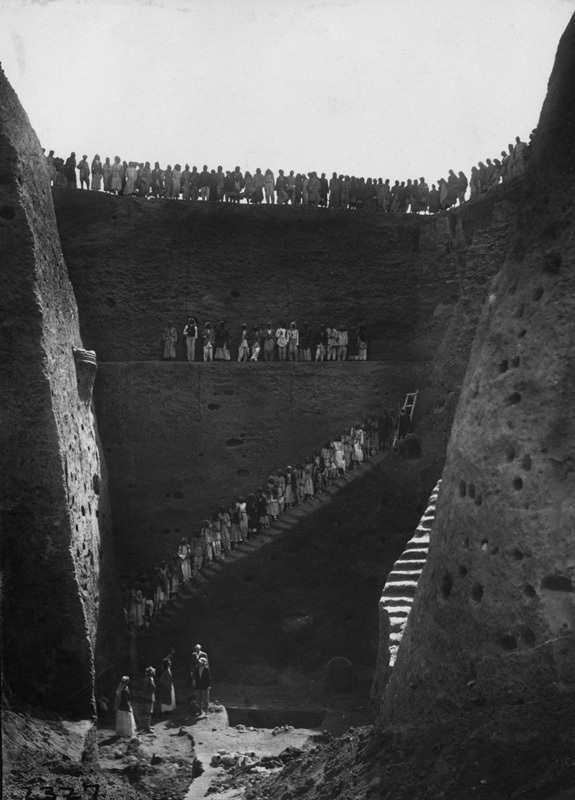 Burial at the Royal Tombs of Ur: The attendants were arranged as shown, then they were given poison to drink. 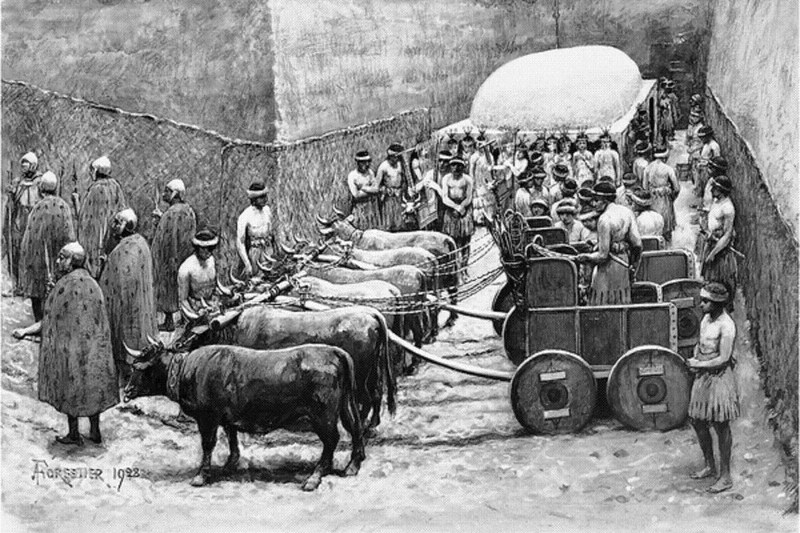 The oxen were also killed. The structure in the background is the domed burial chamber. The female attendants, with their elaborate headdresses, are lined up before it. The men on the left are the soldiers who will guard the tomb for all eternity. When the picture is enlarged, one can see many of the artifacts displayed on these pages. 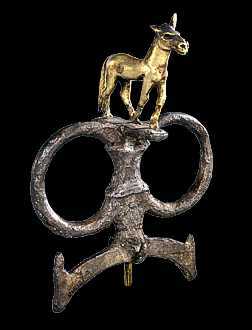 Included are: the weapons of the soldiers, the ringed reign posts between the oxen, and the two bull-headed lyres. Available from All-Posters is an interesting illustration by the artist (Amédée Forestier) which was never published, showing the same scene moments before it was covered in soil. Also see a painting of the burial. 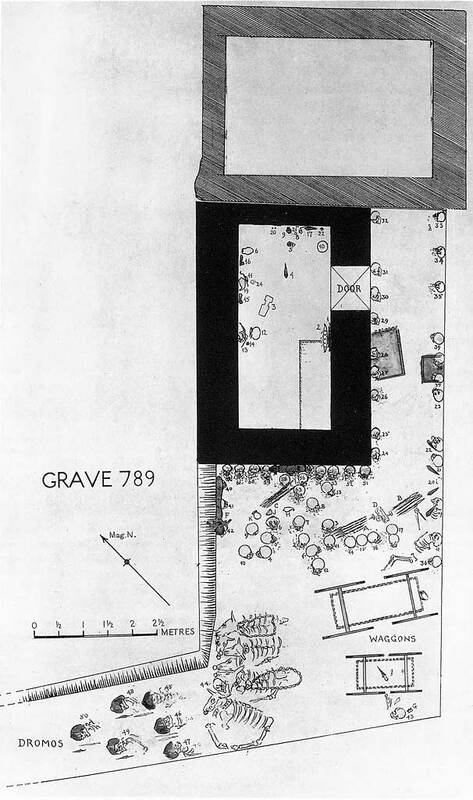 The floor plan of The King's Grave (PG 789). 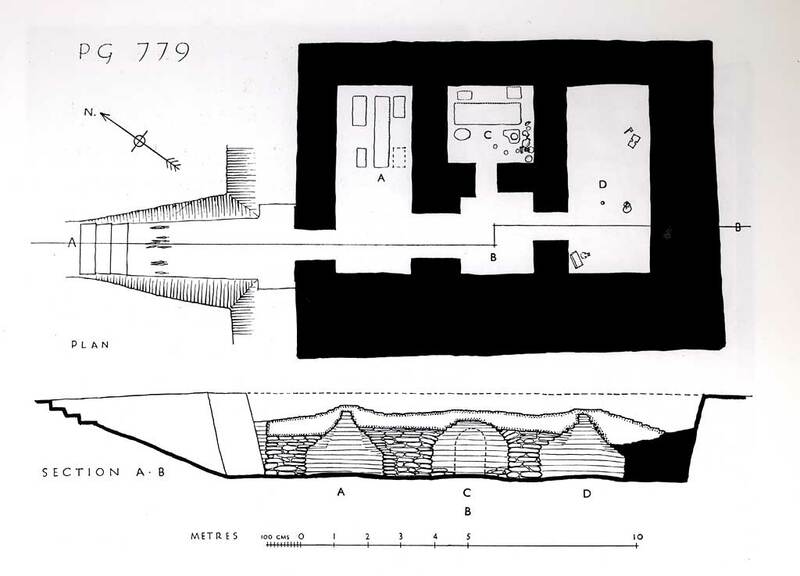 As can be seen in the drawing, the burial chamber had been plundered in antiquity, but the death pit was completely undistrubed. 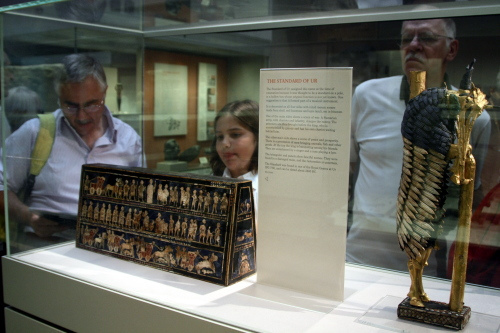 The silver boat model found beside the door of the burial chamber is one of the few items that wasn't taken. It can be seen in the Miscellaneous section. 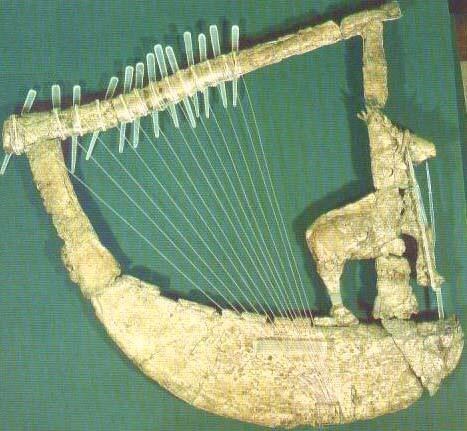 The Great Lyre is seen leaning against the wall with the row of the female attendants. 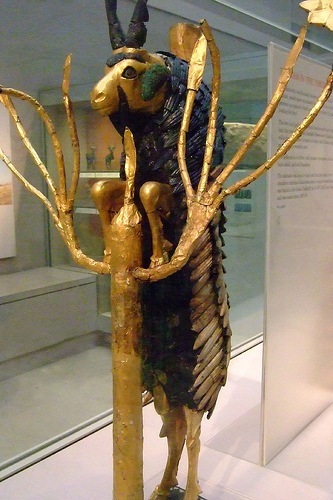 Another large lyre, now in the British Museum, leans against the lefthand wall. 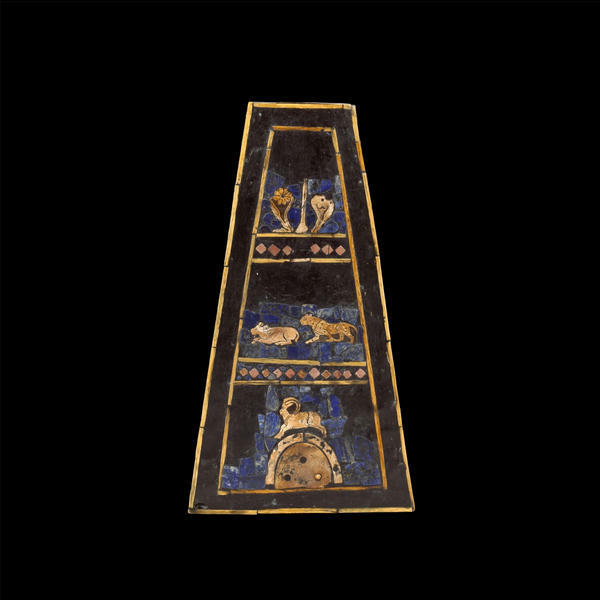 Although designed for younger audiences, Mesopotamia.co, by the British Museum, has an interesting feature that allows you to drag the cursor across floor plans of the tombs to find some of the artifacts in their original location. and lapis lazuli overlaid on wood. The dark lines that add detail to the shell figures were made with the application of a hot iron. 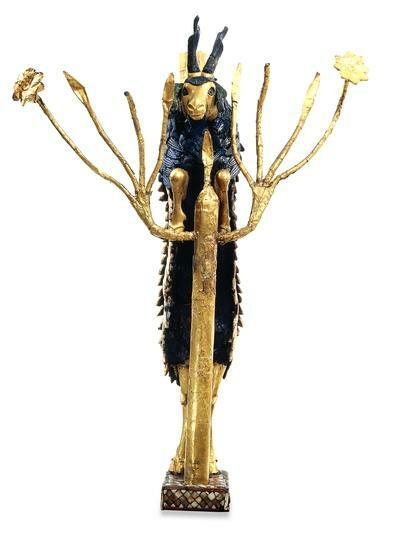 The Standard of Ur is 21.59 cm high and 49.53 cm long (8.5 x 19.6 inches). The front panel is called "War". The back panel is called "Peace". War: In the top row, the king (center) stands with his troops and chariot while prisoners are paraded before him. 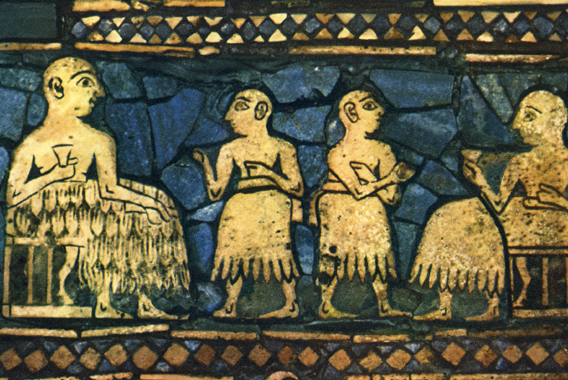 The middle row depicts Sumerian soldiers on the attack. There is a brief battle and the enemy runs away. The last row depicts an attack of Sumerian war chariots, with the bodies of the enemy being trampled beneath the horses' hooves. 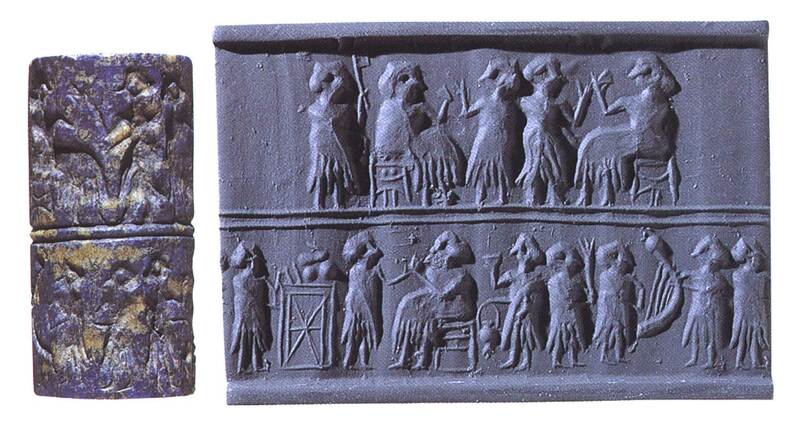 Peace: The king (top row, third from the left) drinks and celebrates his victory while listening to the music of a bull-headed lyre (see below). The bottom rows show his subjects in a ceremonial victory procession. The details of the standard show up much better with enlargement. Enlarge: War Peace. The end panels of the Standard of Ur aren't too often published. See the war end panel and the peace end panel. The images on the panels are explained in "The Standard of Ur: War". A Sumerian soldier with a war chariot: He carries a battleaxe, and his leather plated armor is draped over his shoulder. The horses are caparisoned with the same kind of leather armor. Sumerian soldiers on the attack: They wear cloaks and helmets and they carry spears. See a high-resolution photograph of the soldiers. War chariot on the move. It is equipped with javelins and a mace. It carries two soldiers; one to drive the chariot and one to throw the spears. 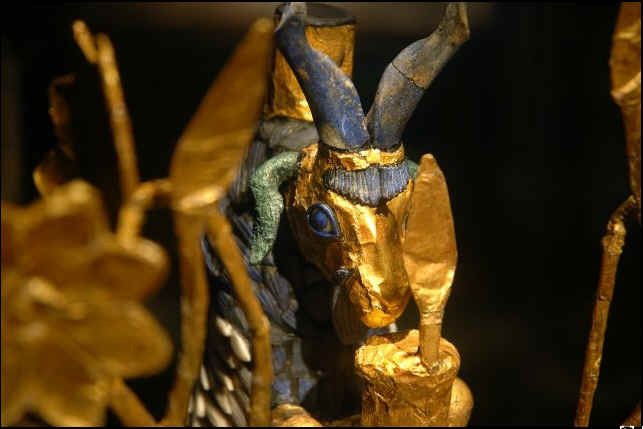 Click on any of the chariot images to see high resolution photographs of them. 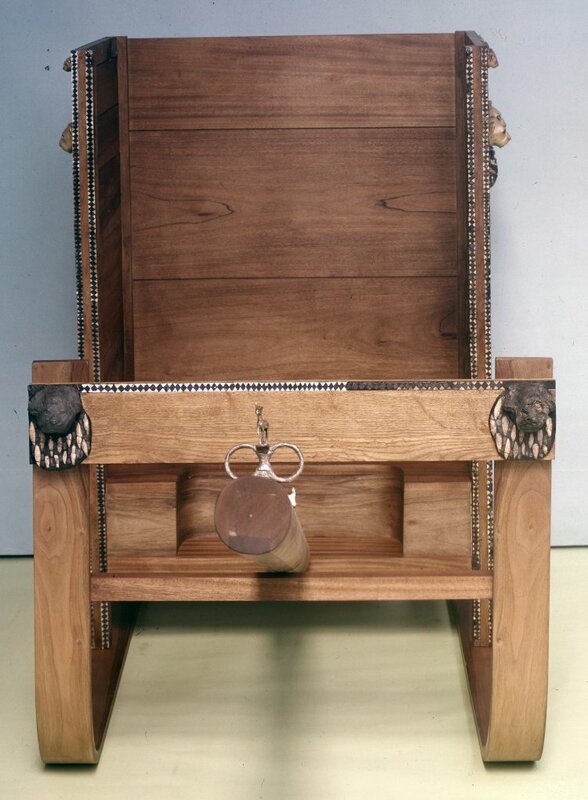 See a photographic reconstruction of the chariot. 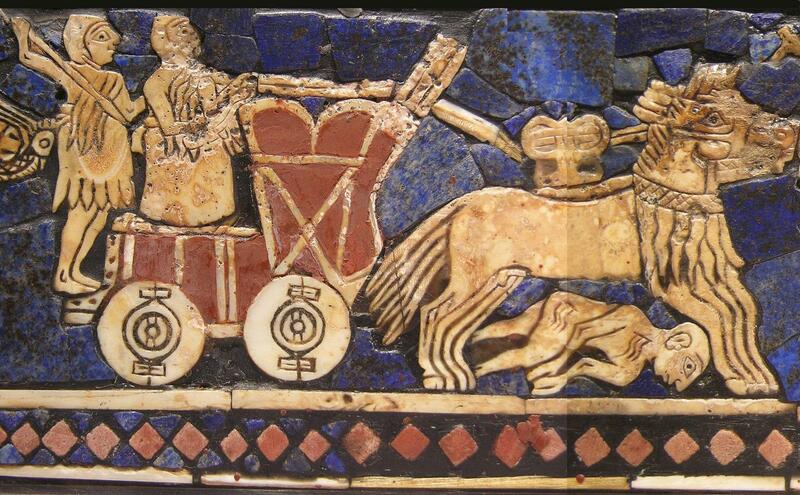 The reconstruction of the chariot scenes is descibed in Sumerian War Chariots. War chariot in action. An enemy soldier is trampled beneath the horses's hooves while a Sumerian soldier prepares to finish him off with a spear. 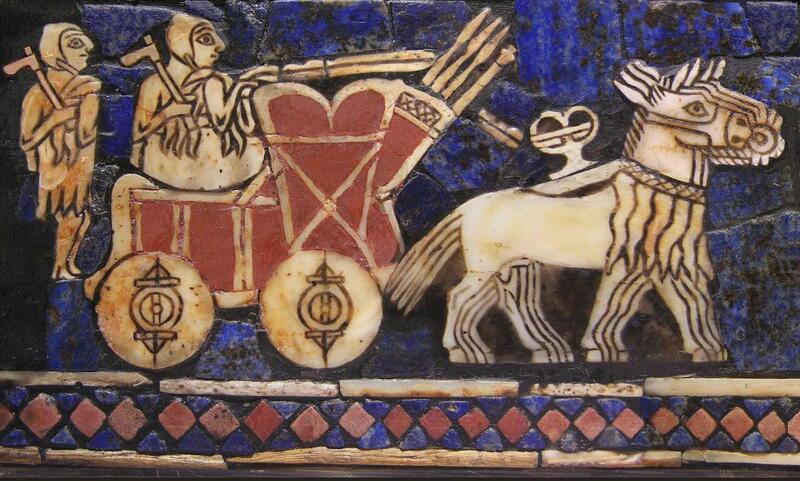 I reconstructed this chariot scene (and the one below) to compensate for the damage done to the figures. See the chariot in its original condition. 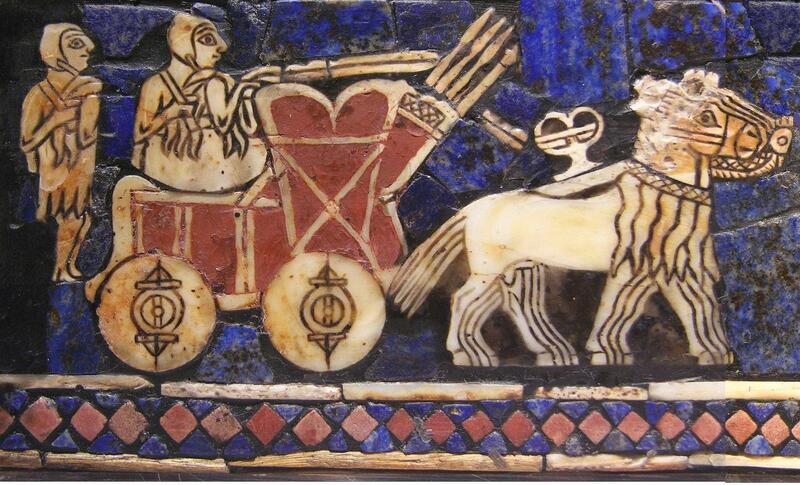 Sumerian war chariots on the attack (reconstructed). The details of the war side (along with a new interpretation of them) are described on a separate page. See "The Standard of Ur: War". The king's audience. After his victory in battle, the king has a drink with his cronies (generals and noblemen) while being attended by two servants. Music for the victory celebration is provided by a man playing a bull-headed lyre, accompanied by a singer. The king's subjects are in a religious procession, bringing forth the abundance of the Land, sheep, bulls, goats, etc., in thanksgiving to the god of victory and their king. They are led by a man with his hands folded in prayer (top right). The bulls are led by ropes threaded through their nose rings. The lines dangling at their sides are not ropes, but ribbons, or perhaps the hems of a kind of decorative apron. The bulls (and the goat) are "garlanded for sacrifice", which will be performed during the opening ceremonies. The horses shown in the scene below wear the same apron. The other animals will be eaten during the victory feast. The man second from the right (bottom row) carries some freshly caught fish. 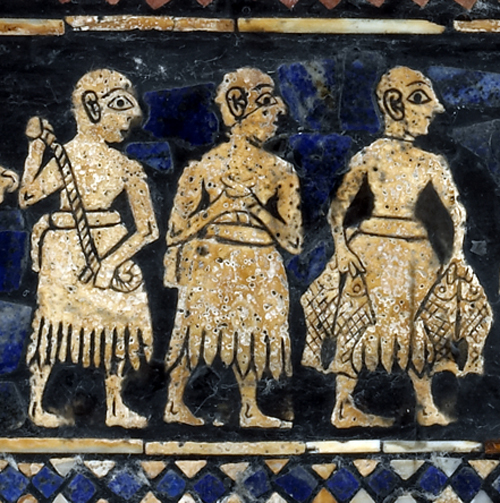 The procession continues with scenes of the defeated enemy, distinguishable by their "angled-skirts", carrying tribute in bags and in backpacks to the victorious Sumerian king. The king's royal sceptre. 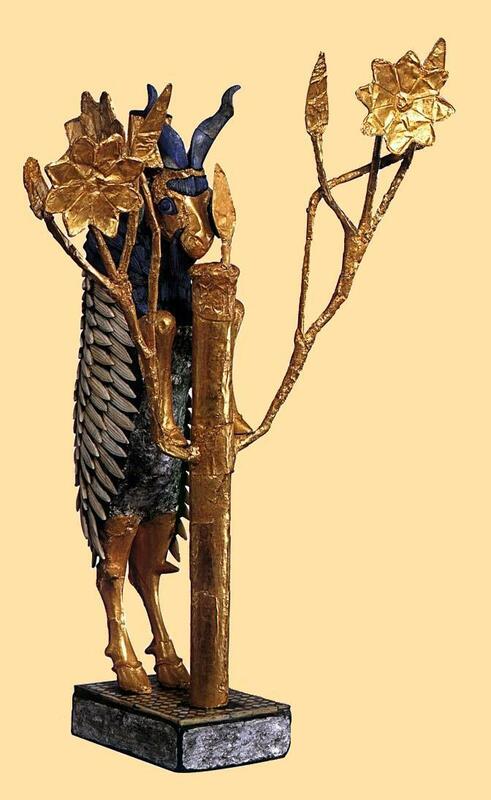 This sceptre was found in the largest of the royal tombs (PG 779). 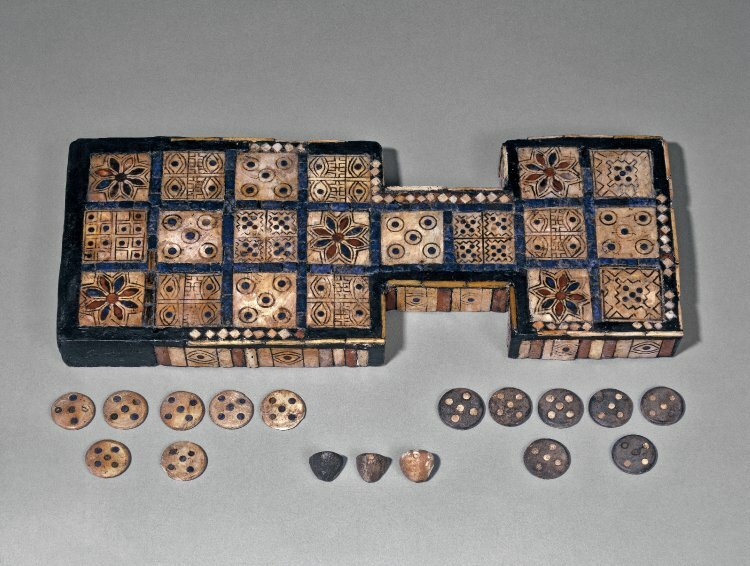 The end caps are mushroom-shaped shells, inlaid with red and blue rosettes. There are five bands of thin gold foil that have designs in bas-relief, as if they were cylinder seals, but they are no longer recognizable. 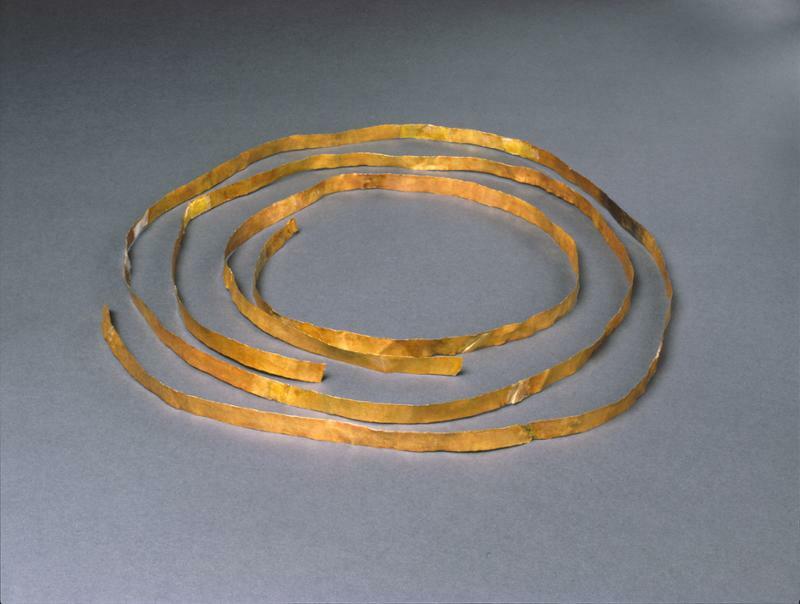 The gold bands are separated with rings of lapis lazuli. 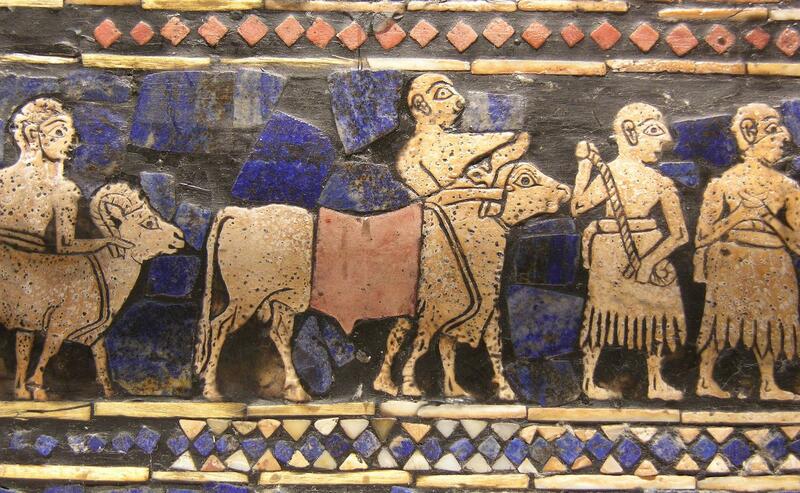 The other bands are mosaics of shell and lapis lazuli triangles, separated by rings of shell and red limestone. It is 41.5 centimeters in length (16.33 inches). PG 779 is the same tomb where the Standard of Ur was found. 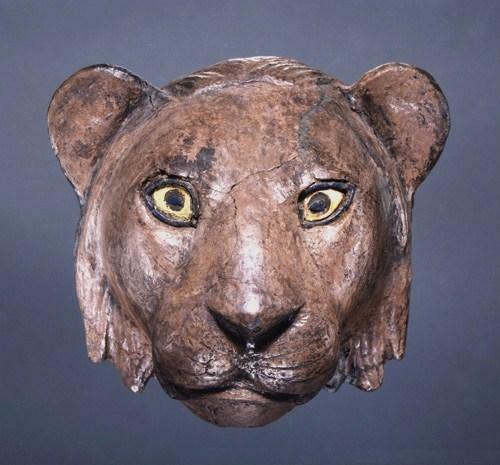 The Lion of Ur: Made of silver, it was probably used as a finial for the arm of a chair. His eyes are made of shell and lapis lazuli. 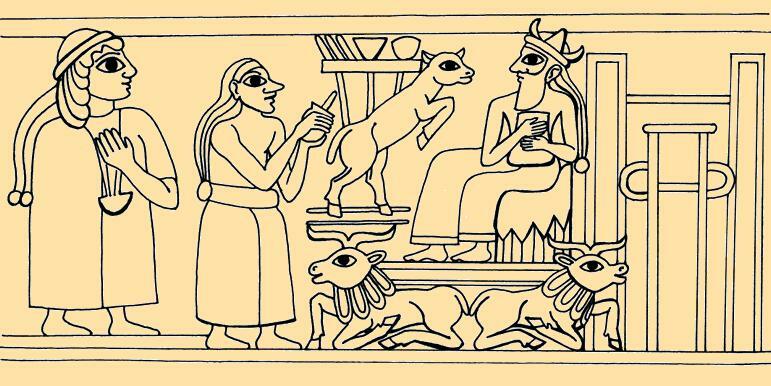 of statue was sometimes used to support a table, as can be seen on a cylinder seal drawing by S. Beaulieu. The statue is 45.7 centimeters high (18 inches). Click here to see a closeup of the ram's face. Click here to see a massive enlargement of The Ram in the Thicket. 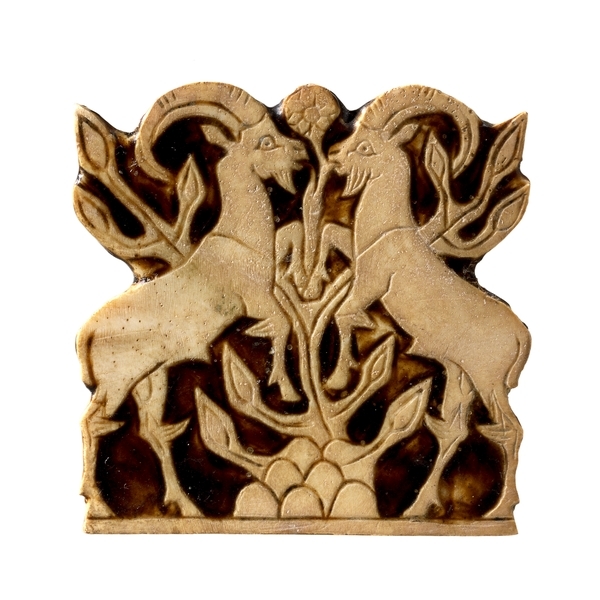 To get some idea of the overall scale of The Ram in the Thicket, and of the Standard of Ur, click here. 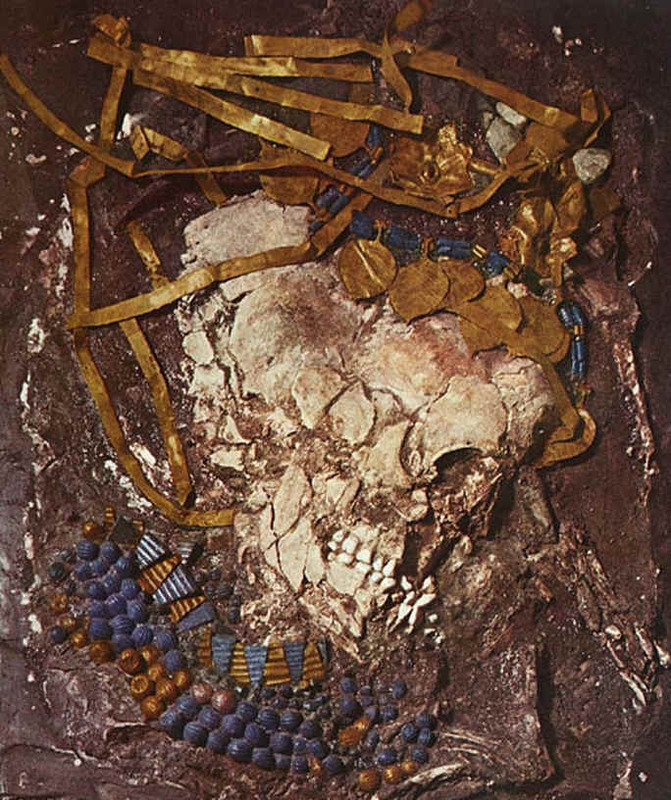 Queen Pu-abi: Most of the spectacular treasures from The Royal Tombs of Ur came from her burial chamber, which hadn't already been looted by grave robbers. Queen Pu-abi was less than five feet tall, and she was about 40 years old when she died. Her headdress is supported by a large wig. 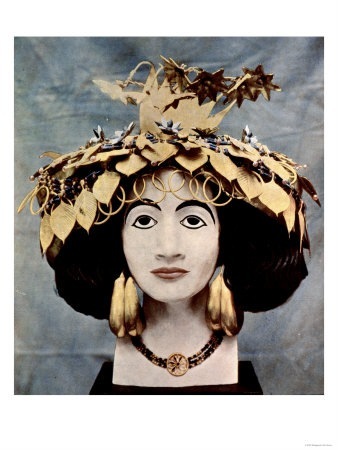 The headdress was reconstructed by Leonard Woolley's wife, Katherine. 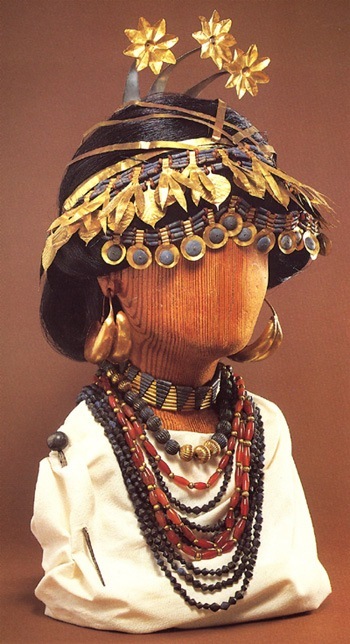 The face was modeled on the features of a local woman living near where the tombs were discovered. to serve her in the afterlife. 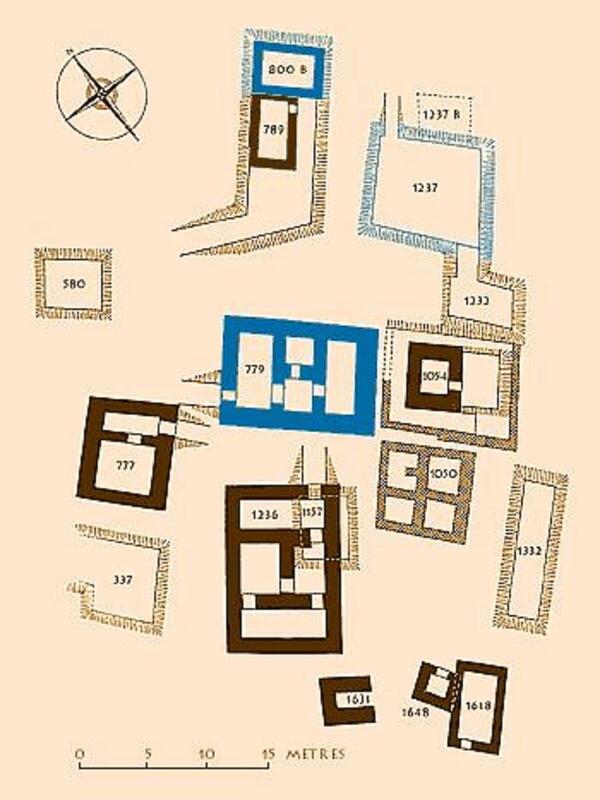 The floor plan for Queen Pu-abi's tomb (designated as PG 800): The tomb chamber containing Pu-abi’s bier, body, and three attendants, is seen at the top of the drawing. 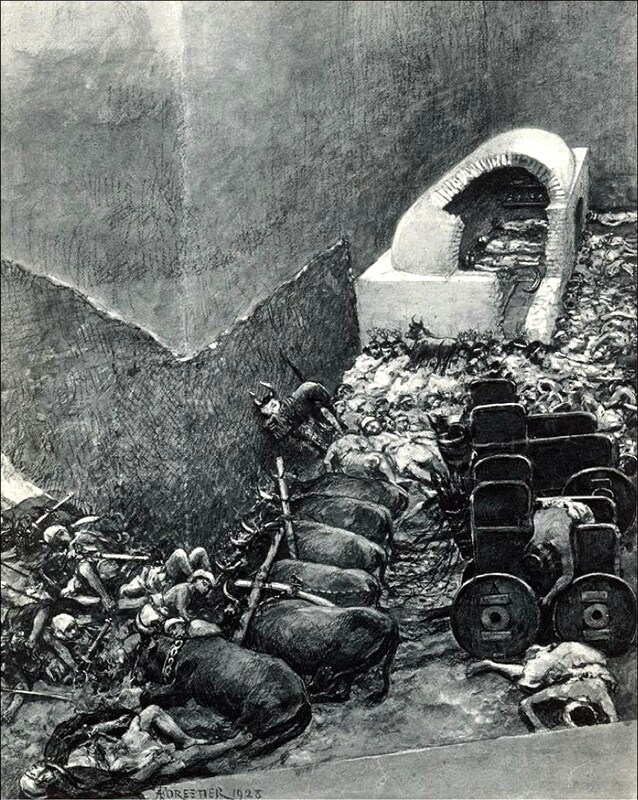 The death pit, with a wooden chest, chariot, oxen, and more attendants, is shown at the bottom. 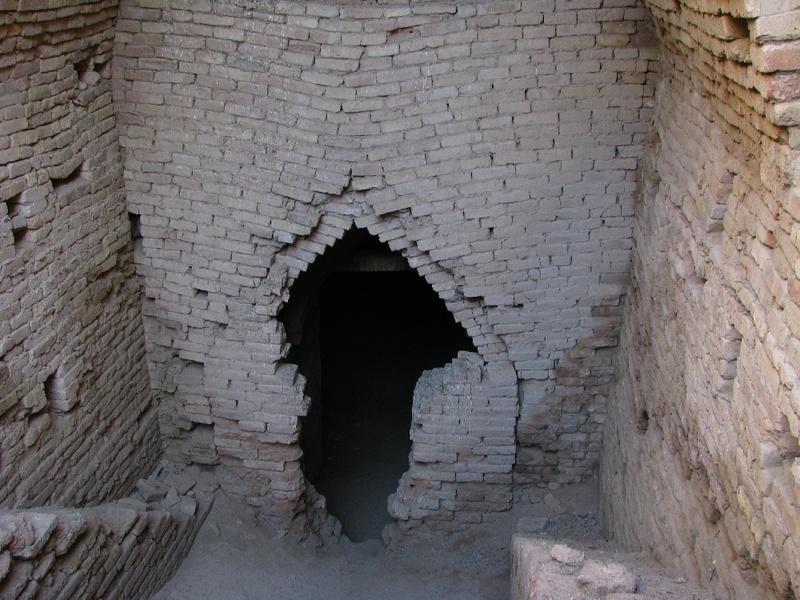 Puabi's tomb didn't have a door, which means her body was placed there before the roof was constructed and the tomb was sealed. 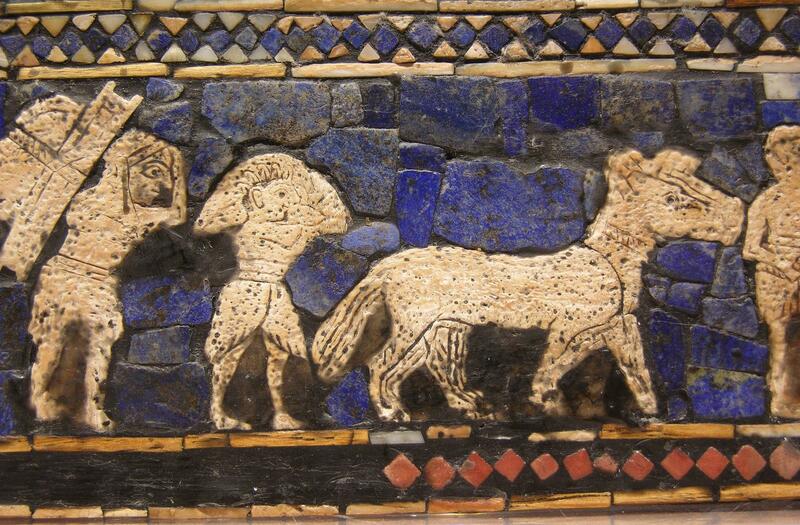 The details of the tomb are best seen when the picture is enlarged. Queen Pu-abi lay on a wooden bier, a gold cup near her head. She wore an elaborate headdress, and the upper part of her body was entirely hidden by multi-colored beads. 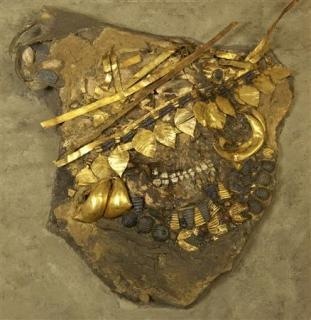 She was surrounded with her personal possessions, the richest found in any Sumerian tomb. Buried with her were the bodies of 26 attendants, men and women, and a team of oxen harnessed to a decorated processional chariot. 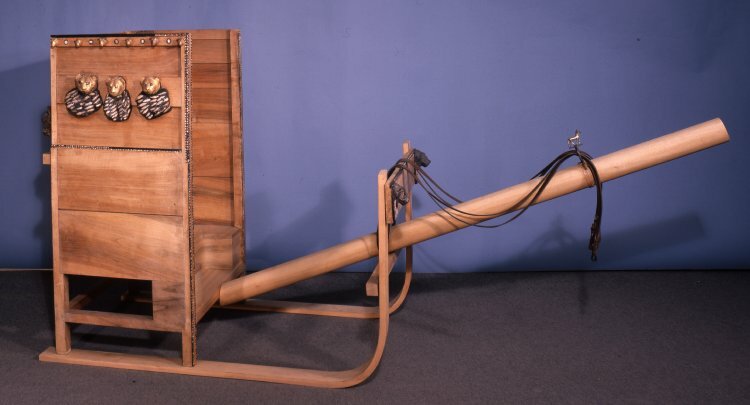 The decorated ceremonial "chariot" (sledge) found in Queen Pu-abi's tomb. Atop the central shaft is the rein rings used to separate the reins between the two oxen. See the front of the sledge. 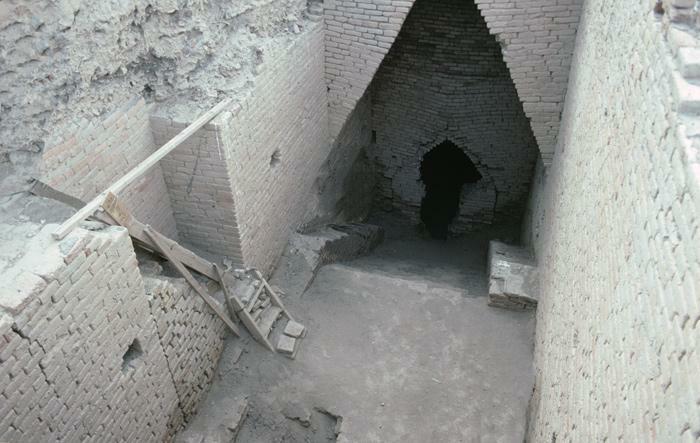 A female attendant in situ, as she was found more than 4,500 years after she was buried. This image is sometimes ascribed to be Queen Pu-abi herself, but the jewelry doesn't match, as can be seen in the Jewelry section. This woman was found in the Great Death Pit. See a photograph of Pu-abi's gravesite. 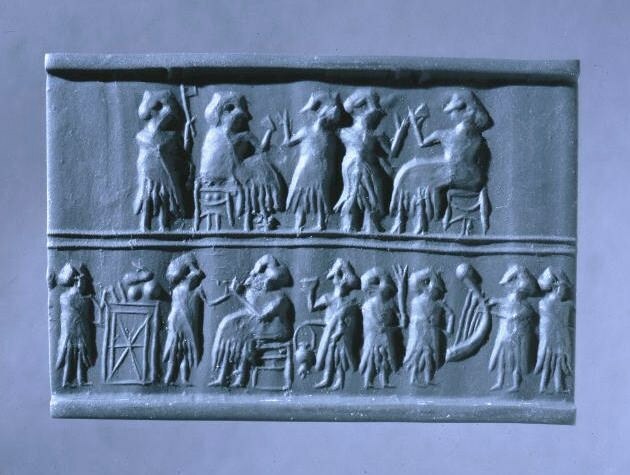 Queen Pu-abi's cylinder seals: She was found with three cylinder seals which were pinned to her cloak. 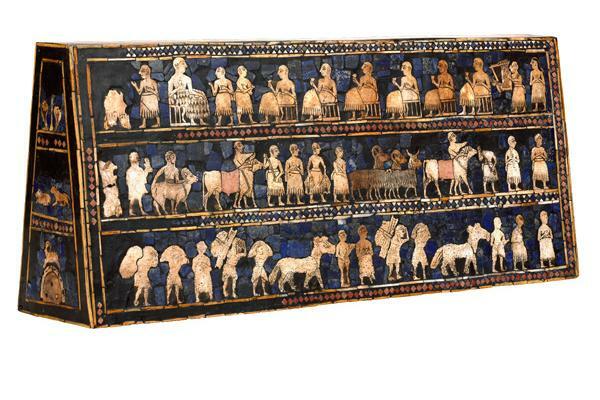 The cylinder seals are made of lapis lazuli. 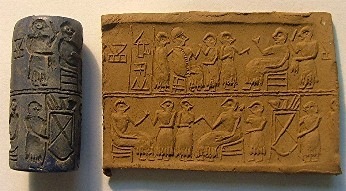 The first seal impression depicts a banquet, with the royals feasting and drinking while being attended by servants (notice how the servants are drawn smaller than the royal personages). The table is piled high with food and drink. Pu-abi's name is in the lefthand corner. The sign on the far left is nin/eresh, meaning "lady" or "queen". See a different, enlarged image of the seal. The second seal impression also shows a royal banquet. The middle of of the top panel shows a man and a woman (Pu-abi herself?) drinking from a vat of beer using long straws. The straws were used to avoid the foul-tasting foam on top of Sumerian beer and the dregs on the bottom. Other people are shown feasting and drinking wine. Enlarge. The third seal impression shows another banquet scene (starting to notice a pattern here?) this time all female. 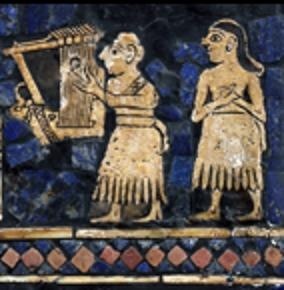 On the right of the lower register can be seen a woman playing a harp. Enlarge. An attendant of Queen Pu-abi. All of the women wore elaborate headdresses and jewelry. Another view of the same attendant. 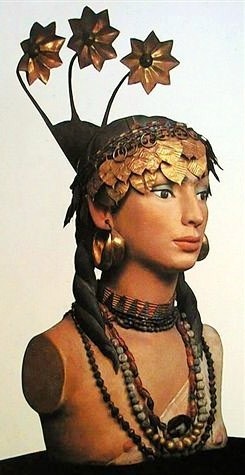 Another attendant, as she was found 4,000 years later. To wile away the time in the afterlife . . .
Several lyres, and the women who played them, were found in her tomb. and is pictured in the Miscellaneous section. Game dice. 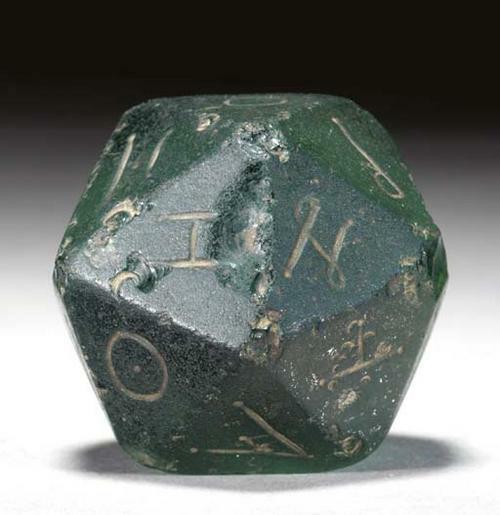 The dice for the Royal Game of Ur wasn't found, but this is perhaps the kind of dice that was used. Pu-abi's gold cup. The handle is actually a hollow spout. It was used like a straw to avoid the unsavory foam on top of the beer and the dregs on the bottom. 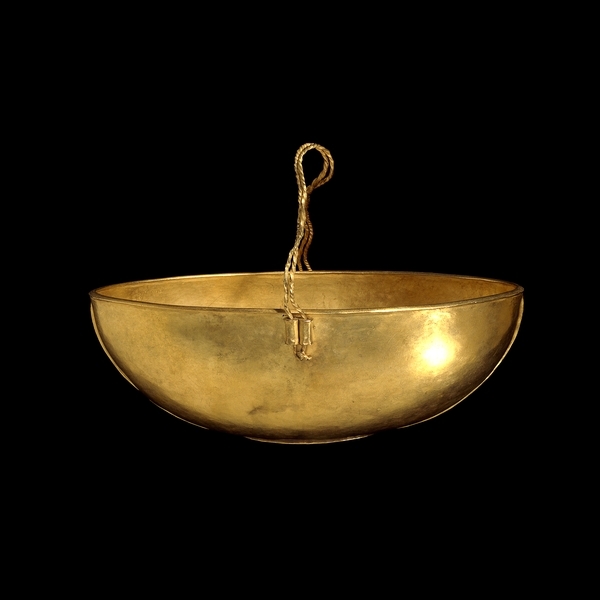 Golden bowl. This bowl lay near the body of Queen Pu-abi. Inside it was found a silver straw, meaning this bowl was also used for drinking beer. 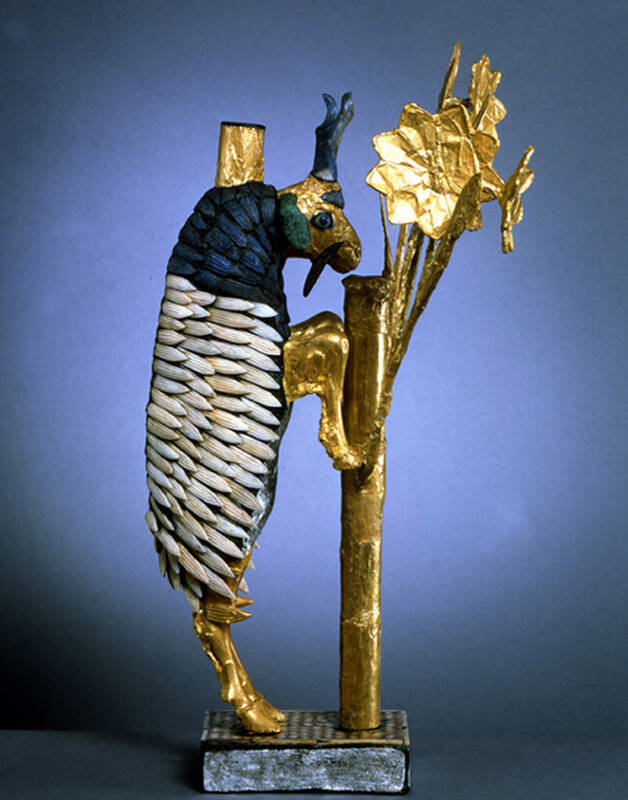 Continue the tour to: Lyres or go to: Vessels, Jewelry, Miscellaneous, Weapons.